A new, statewide mass media campaign featuring Tight End Julius Thomas launches this Sunday. 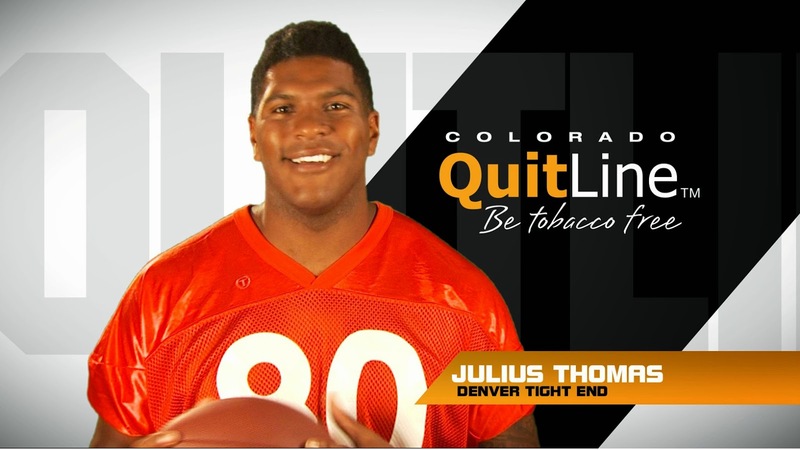 The campaign features Thomas providing motivational messages encouraging Colorado tobacco users to call QuitLine for support. This campaign includes tv, radio and out of home advertisements - and will be active for the next few months. Keep your eyes open for these ads if you’re watching football on Sunday. Throughout the years, QuitLine call volume has spiked during promotional campaigns featuring local professional football players - including Wesley Woodyard and John Lynch. Research shows smokers who use Colorado QuitLine services are more likely to successfully quit than smokers who try to quit on their own.